Flash cutting uses a oscillating razor-sharp knife CNC cutter and this eliminates the need for rule dies. These machines can slice through semi-rigied, soft, flexible materials with precision and speed. Flash cutting requires no special tooling, is cost-effective to operate, efficient on material use and can cut on straight/square edges. Utilizes a high-powered laser to cut out shapes on sheets on material. A computer-aided design (CAD) program moves the laser on a path to cut out the desired shape. This method is used for materials that are harder to cut using traditional die cutting methods. The cut provided by the laser is cleaner and more precise, allowing for tighter tolerances on your finished gasket. Is the process of high pressure water being forced through a small nozzle producing an extremely clean and precise cut. 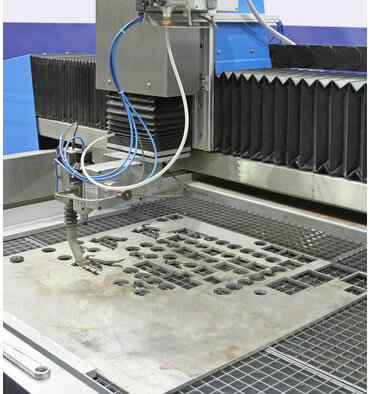 An advantage of water jet cutting is that it allows parts to be tightly nested maximizing yields. Water jet technology offers extremely accurate cuts of complex and intricate parts, efficient use of materials and less compression distortion. Another benefit of water jet cutting is that it is an excellent method for producing prototype and test parts or short production runs. It is also a very clean process, with water as the only byproduct. Are manufactured from a tube of rubber by inserting a mandrel into the tube and cutting the finished dimensions with a knife while the mandrel is being turned at high speed in a lathe type machine. Lathe cut gaskets offer maximum cost-performance benefits in many applications and is usually the best choice where a static seal is needed. Its square or rectangular cross-section provides a wider sealing surface and superior resistance to compression set than molded O-rings. Lathe cut gaskets are typically less expensive than molded alternatives and is a great choice for high volume gaskets. Lathe cutting also is good when beveled edge gaskets or tight tolerance gaskets are required. The lathe cutting process is also a good choice when large OD gaskets or small ID gaskets are required. Filter gaskets and food grade gaskets can also be produced using this method. Is the process in which pressure sensitive adhesive backed material is partially, but not completely cut through. This method cuts through the actual gasket material and adhesive to the liner on the back. By cutting the gasket in this method, the gasket retains its pressure sensitive adhesive (PSA) backing and liner allowing for a “peel and stick” application. Are you looking for Cutting?